Tennis Championships Seeks Kiddie Ace Reporter! 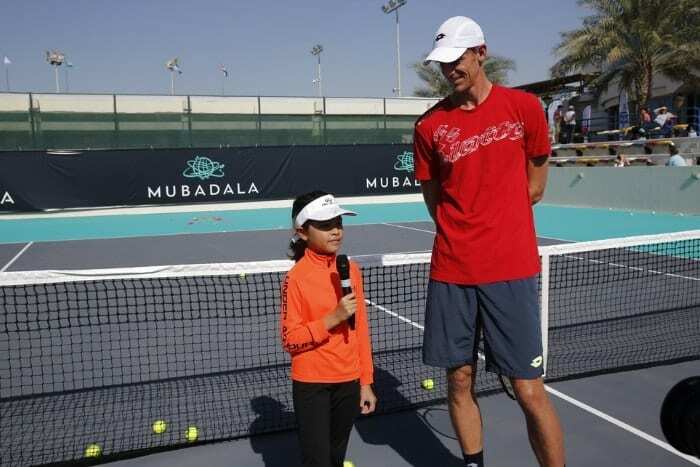 The Mubadala World Tennis Championship (MWTC) are searching for an official ‘kiddie reporter’ for the tournament taking place on 27th to 29th December 2018, at the International Tennis Centre at Zayed Sports City in Abu Dhabi. Last year’s winner, Alyssa Kerner pictured above interviewing last year’s winner Kevin Anderson, also attended player press conferences interviewing Jelena Ostapenko and Serena Williams as well as reporting live from the event on the radio for DubaiEye. To be in with a chance to be this year’s ‘kiddie reporter’, MWTC is asking children between the ages of 6 to 14 years, to submit a video showing off their journalistic skills. Whether they are interviewing friends, family or a teacher – this is their chance to shine. To participate, all videos must be posted by 29thNovember on to Facebook, Twitter, or Instagram using the hashtag #MWTCKiddieReporter. The videos can also be sent as a Private Message on the MWTC social media handles, however, the video must be visible to the public and not a locked profile. The ‘kiddie reporter’ will be announced on 5th December. Don’t forget to ask your parents or guardian’s approval!!! Now celebrating its eleventh edition, the 2018 Mubadala World Tennis Championship will take place 27 to 29 December 2018 at the International Tennis Centre at Zayed Sports City. Beyond the three-day tournament itself, the Championship is committed to creating a lasting legacy for tennis in the UAE through various community programmes that raise awareness of the benefits of tennis and the importance of a healthy and active lifestyle. This year’s MWTC will feature a strong line-up six male players and two female players, all of those who are at the top of their game. The line-up already includes some of tennis’ finest including world number two Novak Djokovic, Dominic Thiem (7), 2018 Wimbledon finalist Kevin Anderson, Karen Khachanov (19) and Hyeon Chung (27) and seven-time Grand Slam winner VenusWilliams.